A white monkey in a dancing attitude is depicted on the left. He is wearing a loincloth with black and white checks. His armlets, wristlets and anklets have three sharp points. He has sharp thumb nails. A text in Balinese script in ink reads: marutisuta, Marut’s son. Marut is a Sanskrit name for the god of the wind. Hanuman is meant by it. On the right is a demonic figure with blue skin, his legs spread and his knees bent. He holds a snake hanging down in front of him with both hands. At the top on the right is written: megenadda, by which Meganada, a son of Rawana, king of Langka, is meant. The snake is an arrow. Meganada is about to throw the weapon at Hanoman. 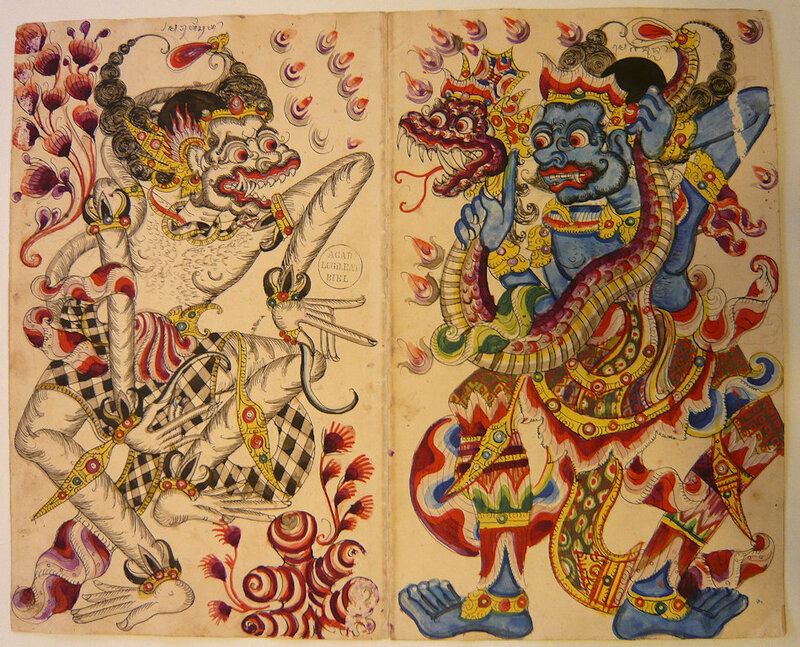 This scene refers to an episode described in the Old Javanese Ramayana IX: 63-83. Hanoman goes as an envoy to Langka. He destroys the flowers and the trees in Rawana’s garden. Meganada comes and fights Hanoman. He uses all sorts of arrows, but they do not wound the monkey. Finally he takes his snake-arrow. It is as large as a lontar-palm and has the head of a snake with large fangs. The arrow winds itself around Hanoman.